She officially turned 100 years old on Friday, January 25, and celebrated with a party at Vanceburg Rehab and Care where she is a resident. On Saturday, she celebrated some more with friends and family on Blue Spring Road. 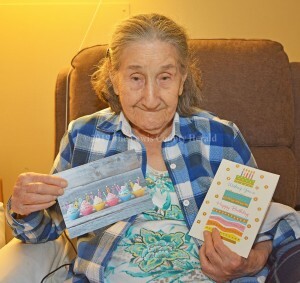 “There’s no need for such a fuss,” she said of the event while looking over some of her many birthday cards mailed to her for the occasion. “I never thought I’d make it,” she replied when asked to reflect on the occasion.